Workbox: Website Development: Outsourced or Outhoused? You’re a brilliant marketing consultant and web designer! The site you designed for your client launched on-time and on-budget. The outsourced development shop did a great job at a great price. Your client loves you. The trouble started a month later. The client wants some new features and the developer isn’t responding. You need to update WordPress, but don’t have a staging site on which to debug. The platform or design isn’t scalable for new features or content sections. You and your client don’t have permission to access the web server. You don’t own the Google Analytics account. Who has the domain registrar login? And your client doesn’t want excuses. And your profit margin is shrinking. Yeah, you went cheap, and now that $500, $2,000 or even $5,000 isn’t looking like such a bargain after all! You “outhoused” your website development. Don’t get me wrong – a lot of marketing and design consultants have great success with inexpensive website development outsourcing. They’re successful because they did their homework and clearly defined the project, not just for the developer, but for their client as well. There are some big issues that inexperienced consultants have with outsourced developers. > The developer isn’t going to warn you about or protect you against things that will cause problems later on, and may actually have an incentive to NOT warn you (issues around hosting, content management systems, analytics systems, domain registration). > The developer isn’t going to tell you things you don’t want to hear or say “no” to any request. > The developer will not “fill in the blanks” if instructions aren’t accurate or clear. This isn’t necessarily the developer’s fault. They make money by quickly and efficiently building websites – and assume you know what you want. When they get a request that doesn’t fit into their basic model, they get confused and unresponsive, and don’t know how to pull clarification out of you. Also, they may use a simple, inflexible solution to solve a problem you don’t understand or want to deal with so they can keep the project on-time and on-budget. Sure, some are flaky jerks, but most are really trying to do a good job. Here’s the deal: you’re not getting a true partner with many inexpensive outsourced development teams. You’re getting worker bees. Clearly and accurately define the task and everything works great. Deviate and get stung. Discuss hosting and be sure you are permitted to have access to the live website code. Understand your client’s long-term plans (1-2 years is enough) for the website and be sure to account for them in the design and technology platform. Confirm that your client has the logins for everything! Hosting, domain registrar, analytics accounts, third-party service providers. Define a website software update process. WordPress and other software needs to be updated regularly for security purposes. Require a development or staging site to test software updates and technical enhancements. The good news is that if you do your homework, clearly and accurately describe your project and requirements, and manage your development team correctly, you can build a great relationship with an outsourced developer. 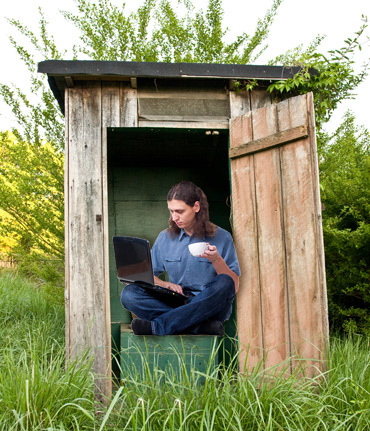 Then you get a reliable partner – and you and your projects won’t fall into the outhouse!